The Fall 2018 (Wave 15) Wave of Exemplar is now open and accepting your recognitions of the amazing things your fellow judges are doing. This wave will remain open until 11:59 PM PST on Nov 20th. 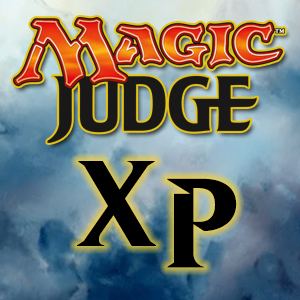 If you missed the cut off or had an awesome interaction with another judge at Nationals, head on over to Judgeapps and enter a nomination now. Wave 15 will follow the same slot allocation we have been using for a while. The Exemplar Team is hard at work on processing the Wave 14 Nominations, with the expectation to release the nominations in early to mid-September. In the past, we have taken a harder look (or completely disallowed) nominations for Admin tasks at events like GPs, or SCG Opens. The reasoning was that these activities were not relevant to judging. Admin stuff happens on the stage, Judge stuff happens on the floor. In the past admin roles were only sporadically filled by Judges, so the distinction was much easier to make. However, things change over time, and when they do, policies need to be re-examined. Judging is about running events. We typically think of Judging as being out on the floor answering rules questions, but that is only part of it. Judges post pairing, cut slips, sort slips, monitor twitch streams, assemble players for Coverage photos, and help prep product for a sealed side event. None of those tasks are “floor judging” or require a specific level. We don’t question if they are Judge tasks, and they are still vital to a successful event. There are also other roles at large events; Registration, Score Keeping, Prize Wall, Strike team that are increasingly filled by judges, and are equally vital to a successful event. As such, we are now considering those roles as ‘relevant’ with respect to Judging and Exemplar. We will still apply the same criteria that we do to other nominations. We will continue to look for significant actions within those roles. I’ve often said just working a PPTQ is not sufficient for an Exemplar nomination. You need to explain how the judges actions at the PPTQ were exceptional and something others should emulate. The same holds true for the Admin roles. Being a Scorekeeper and entering results isn’t particularly significant. Dealing with a long line just comes with the job for someone on Registration. Demonstrating customer service skills at Customer Service is the job description! But performing exceptionally, motivating or mentoring others is still something we want recognized. If they did a ‘good job’, you should be able to recognize that provided that you can describe what made the job exceptional. There is however, one exception. Judges that are Tournament Organizers are still ineligible to receive nominations for Tournament Organizer tasks. The introduction of tokens has been overall positive. It’s created a significant logistical challenge on our end, but the cost is showing to be ‘worth it’. Last week I even learned that one region is looking at going back and making tokens for nominations in previous waves! I’m extremely happy that we found a way to make the Exemplar recognition more tangible and more meaningful to the judges that receive them. The removal of proxy nominations and change in the foil distribution were both significantly less popular. There was a long forum thread, and lots of FB posts, and a Reddit thread. I read every one I could find. In the wave immediately following the announcement, the total nominations dropped by a third. It was unclear how much of that was from the changes. Christmas time is always “slow” for Exemplar, and other incidents contributed to a program-wide morale problem. There was clearly no way to measure how much one factor contributed over others, but I felt pretty comfortable in the belief that it was predominately the changes introduced with Wave 12. The numbers were approximately the same for Wave 13, but with Wave 14, we saw a 9% increase. I’ve got theories on why that is, but they are just that, theories. However, we knew that participation in Exemplar would drop as a result of the changes, and in an indirect sense, a drop in nominations was ‘success criteria’. When we made those changes, we said these changes were meant to curb some ‘undesirable behaviors’. In that regard, the changes we implemented have been very successful. Reports of abuse or suspected abuse are the lowest in three years. A day before a wave ends, there isn’t this surge in social media posts where people are stretching to fill slots just to fill them. Exemplar nominations are being treated less as commodity to be traded. There is an increased focus on nominations, and more and more Judges are viewing them as something special in and of themselves, not just a vehicle for foils. All of these are intended outcomes. Another outcome is only noticeable when you read a lot of nominations over several waves. The overall perception is that the quality of nominations has increased. And the metrics for flagged nominations support this perception. While the total nominations dropped by a third, the number of flagged nominations dropped by 45%. In this regard, I don’t think judges are writing better nominations. Nothing changed in the waves to encourage that specific behavior. What I believe is happening is that the weaker nominations just aren’t being written, resulting in an overall more healthy pool of nominations. Now, there are still judges that are unhappy with these changes. I’m not going to pretend there aren’t. No system is perfect. And with some of these changes, the best that can be hoped for, at least in the near term, is begrudging acceptance. Ultimately though, it is still my strong belief that Exemplar is healthier, and better positioned for the long term, with the changes than without. That doesn’t mean that I’m not open to suggestions and constructive feedback. As always, if you have any questions or comments, please send an email to ExemplarProgram@gmail.com.